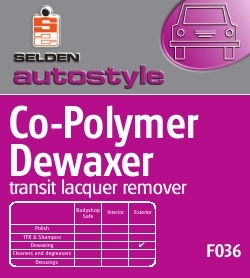 Specially developed dewaxer for fast and easy removal of acrylic, co-polymer protective coatings. Versatile - for machine or hand use. Solvent free and can be diluted with water before use for greater economy. Can be used in hard or soft water areas with hot or cold water. Fully biodegradable and phosphate free. Specially developed dewaxer for fast and easy removal of acrylic, co-polymer protective coatings. HOT WATER APPLICATION 1 Pre-dilute 1 part Co-Polymer Dewaxer with 4 parts water prior to placing in the detergent feed tank. 2 Set water temperature of machine to 60°C. and pressure to low. 3 Adjust detergent feed on machine until flow is sufficient to give required dewaxing action. 4 Dewax vehicle using slow, steady passes of the lance ensuring complete coverage. 5 Turn off detergent feed. Rinse immediately and thoroughly with clean hot water. 6 Dry vehicle and proceed to next stage in Pre Delivery Inspection. COLD WATER APPLICATION 1 Wash vehicle with plain water to remove excess surface dirt. 2 Dilute Co-Polymer Dewaxer 1:4 with cold water. Stir well. 3 Apply solution all over vehicle surface using a low pressure spray or sponge. 4 Agitate surface maintaining moist film. 5 Rinse surface thoroughly with clean water to remove all traces of dewaxer. 6 If needed, repeat process on stubborn areas. 7 Dry vehicle and proceed to next stage of P.D.I. CAUTION: IMPORTANT: READ APPLICATION INSTRUCTIONS BEFORE USE. AVOID USING CO-POLYMER DEWAXER IN DIRECT SUNLIGHT. DEWAXER SOLUTION MUST NOT BE ALLOWED TO DRY ON OR STAINING MAY RESULT. MAINTAIN A WET FILM AT ALL TIMES DURING THE DEWAXING OPERATION. DO NOT USE ON ALUMINIUM COMPONENTS OR ALUMINIUM TRIM AS STAINING WILL RESULT. ANY UNPROTECTED ALUMINIUM TRIM SHOULD BE REMOVED BEFORE DEWAXING COMMENCES.